Afghans fear for their future as U.S.-Taliban talks have been routed by a diplomatic row. Last Tuesday a handful of landmark developments took place in Afghanistan, starting with the transfer of power from NATO-led International Security Assistance Force (ISAF) to local Afghan forces. An announcement that the U.S. would hold direct talks with the Taliban this week in Doha made the day even more significant. The talks were poised to be the first direct engagement between the U.S. and the insurgent group since 2001, when the international troops overthrew the Taliban-led government in Kabul. The Taliban said in a statement, as quoted by the BBC: "The Islamic Emirate of Afghanistan doesn't want any threats from Afghanistan soil to other countries, and neither permits anyone to threaten other countries using Afghanistan soil. We support a political and peaceful solution that ends Afghanistan's occupation, and guarantees the Islamic system and nationwide security." While all of this seemed to point towards hope that the situation in the war-torn country was about to change, it unraveled on Thursday when a diplomatic row over the Taliban’s new office in Doha derailed the insurgent group’s previously scheduled talks with the U.S., to be followed by direct talks with the Afghan government as well. The row was the result of Afghan President Hamid Karzai’s concern that the armed group might use the venue of the talks to mobilize funds for their activities. He further worried that direct talks between the Taliban and the U.S. could render the Afghan government irrelevant to the peace process. 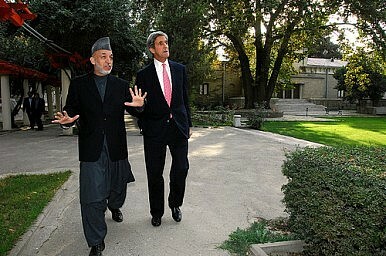 Karzai initially welcomed the U.S. decision to engage the Taliban, but later backtracked saying there is a "contradiction" in America’s stance and suspended the Bilateral Security Agreement talks with it. The main objection involved the name “Islamic Emirate of Afghanistan” given to the Taliban’s office in Doha. According to Karzai’s spokesperson, Aimal Faizi such a name does not exist elsewhere and Washington was made aware of Kabul’s sensitivity regarding this issue. The Taliban has since removed an objectionable sign, flag and flagpole from its Doha office. However, it is not yet certain whether this gesture will be sufficient to get talks back on track. Before the Afghan government expressed its anger about the opening of the Qatari office, it was agreed that the talks would be dependent on the conditions that the Taliban renounces violence, breaks ties with al-Qaeda and respects the Afghan constitution – including the rights of women and minorities. Analysts believe that Karzai’s government is facing an existential crisis, as direct talks with the Taliban without Kabul challenges the legitimacy of Karzai’s regime. The talks in turn give the insurgent group long-sought legitimacy. In the first of a series of dispatches from Afghanistan, David Axe reports on how superior US air power isn’t bringing victory any closer.